Kinston, N.C. - The Lynchburg Hillcats shut out the Down East Wood Ducks on Friday night, winning 5-0, to claim their third straight win. Lynchburg (7-2) used a terrific start from Eli Morgan (Win, 2-0) to hold the Wood Ducks (5-4) to just two hits, and none after the second inning. The victory gives the Hillcats their second shut out win of the season. Morgan fired five scoreless innings and allowed only two infield singles. He walked one and struck out nine, one shy of his career high. Jodd Carter started the scoring in the third inning. Leading off, the Hawaii native belted a solo home run, his second of the year, to put the Hillcats ahead 1-0. Lynchburg tacked on another run in the fourth. Nolan Jones led off the inning with a single and stole second base. With two out, Jonathan Laureano cranked an RBI double off the left field fence for a 2-0 lead. The game stayed that way until the seventh. Laureano, Carter and Luke Wakamatsu all walked to load the bases. With two away, Tyler Friis blooped a single to right, plating two runs and stretching Lynchburg's advantage to 4-0. Friis collected another RBI in the ninth inning on a force out to cap the scoring. Yapson Gomez and Robert Broom each fired two scoreless innings in relief for the Hillcats. The 7-2 start gives Lynchburg their best nine-game stretch to begin a season since 2012. A.J. Alexy (Loss, 0-2) allowed two runs on three hits in 4.1 innings for Down East. Sal Mendez allowed a pair of runs in 3.2 frames, and Demarcus Evans surrendered a run in the ninth. 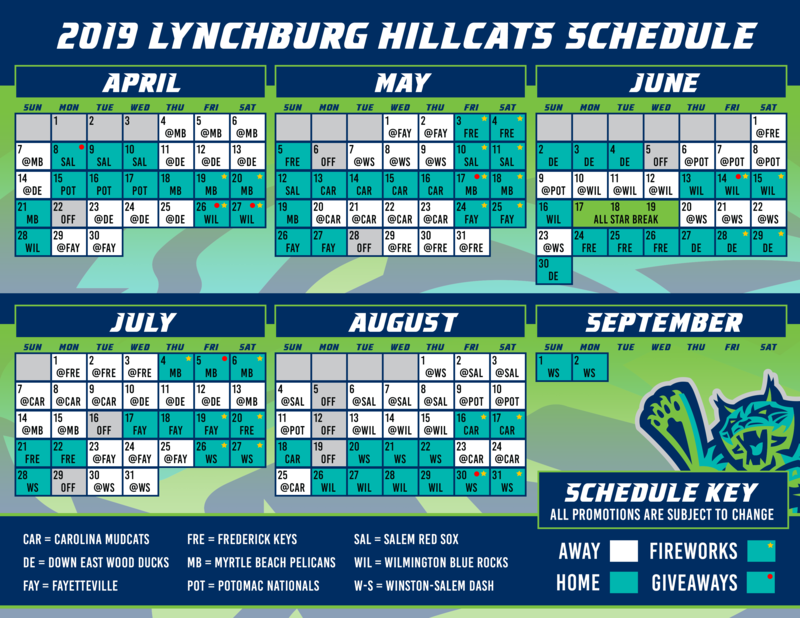 The Hillcats will send left-hander Juan Hillman (1-0, 0.00 ERA) to the mound to face Down East on Saturday in the third game of the four-game series. The Wood Ducks have not yet announced a starter. First pitch is scheduled for 6 p.m. in Kinston. Max Gun will be on the air beginning at 5:50 p.m. on TuneIn Radio and Radio434.